Insider Art are among the most longstanding and experienced arts and health enterprises in the UK. Since 2001, Insider Art, (based in Exeter, Devon, UK), have run courses and conferences, published books, and developed practice. Over the years our arts projects have ranged from devising and delivering collaborative, enhancing healing environments, projects with NHS staff and the people using their services, to interactive artworks for a sculpture trail on Dartmoor. The Partners, Malcolm Learmonth and Karen Huckvale, are both Health and Caring Professions Council (HCPC) registered Art Psychotherapists with many years’ experience of service in the NHS, Voluntary sector, art education, art therapy training, community arts and independently. We have written, published, and presented our work widely. Sarah Holmes is our organiser, administrator, and ensuring things happen person. (For our backgrounds and experience, click the links). These logos apply to Malcolm and Karen as therapists. They do not apply to organisations. They can only be used individually by therapists registered with the HCPC, and who are full members of the British Association of Art Therapists, respectively, to establish their credentials. 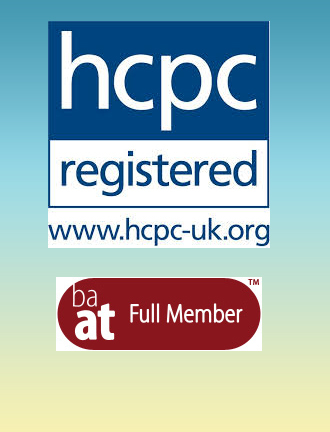 Malcolm and Karen are also registered with BAAT as Private practitioners and as Supervisors.For more about HCPC and Registration click here. Insider Art arose from a passion for working creatively with the arts and mental health. Feedback from our courses and projects shows our enthusiasm can inspire and enable others. We aim for creative, teaching and therapeutic efficacy founded on pragmatism, clear communications and good relationships. Over the years we have worked in a variety of partnership with, and/or provided projects, teaching and services to, amongst others, Devon Partnership NHS Trust, Avon & Wiltshire NHS Trust, Arts and Health South West, Arts Council England and the British Association of Art Therapists. Artists, psychotherapists and art psychotherapists contributing to Insider Art events, courses and projects have included Marian Liebmann, Peter Randall-Page, The Singh Twins and Michael Edwards.